Patrick McCluskey was born in Feeny, County Derry in Northern Ireland about 1832 the son of Henry and Ellen McCluskey. 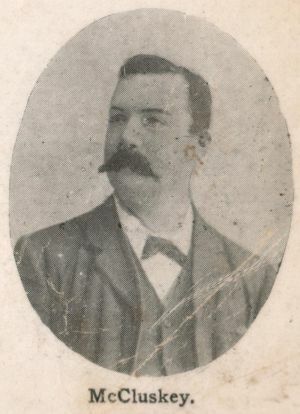 Patrick's brother Michael was the first to emigrate to Australia in 1856. Patrick arrived in Australia on 9 March 1858 aboard the ship "Sir Thomas Gresham" arriving in Adelaide, South Australia. After arriving in Australia, Patrick tried his hand at mining around the goldfields of Victoria around Ballarat and Bendigo. His brother Michael had moved to Queensland in the early 1860's having been married in Bowen in 1864. Michael moved to Mackay in the late 1860's becoming the licensee of the "Horse and Jockey" Hotel on the road to Nebo near the present day Racecourse Mill. Patrick married his first wife Frances Phoebe Hollands at Ballarat on 17 April 1871. 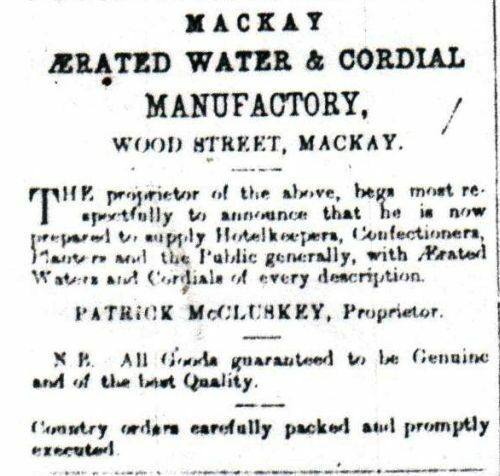 They moved to Mackay in the early 1870's and by 1873 had established business as an aerated water and cordial manufacturer in Wood Street. He later moved his factory to Peel Street. However in 1876 disaster stuck both families. Patrick's son John died on 27 January 1876 and in February Michael, Michael's wife and his daughter all died and then on 2 October 1876 Patrick's wife died. Therefore at the end of 1876 Patrick was caring for 6 children under the age of 12 years, two of his own and Michael's four children. He sold the cordial business to N.C. Morthensen. He soon left returning to Ireland and left four of the children in Ireland for care and education. He returned to Mackay around 1878-1879 and purchased land on the corner of Victoria and Wood Streets now occupied by the Westpac Bank. He became publican of the Shamrock Hotel on Nebo Road in 1881 and then built the Queen's Hotel on the site he purchased. He was granted a victualler's licence in September 1881. Patrick remarried to Julie Callaghan on 29 January 1881 at St. Mary's Presbytery. However, Julie died in 1884 during the birth of their second child. The child also passed away after six months of age. Patrick McCluskey died on 2 January 1889 and is buried in the Mackay Cemetery. The license of the Queen's hotel was taken over by George Wood. The hotel and commercial buildings attached to it however were not sold by Patrick's surviving children until 1912. Mackay Mercury and South Kennedy Advertiser. (2 August 1873). Mackay Family History Society, History of the McCluskeys, unpublished. The Daily Mercury. (1912). The Jubilee of Mackay, 1862-1912 Fifty Years, Mackay QLD: The Daily Mercury. Advertisement from Mackay Mercury and South Kennedy Advertiser.